Not only Shields Shall Be Splintered! 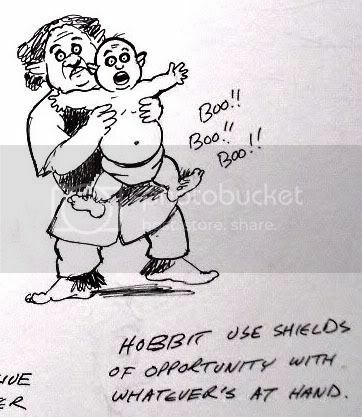 Trollsmyth's Shields Shall Be Splintered rule to give the shield more value in melee is one of my favorite house rule ideas to come out of the OSR blogosphere. It's easy, simple to employ in The Game, and makes sense to my way of playing. It also gives a bit more juice to combat. Like a saving throw, it allows for an exiting narrow escape from a possible nasty end. I like to roll it around in my mind. It has a tasty texture and rule symmetry that appeals to me. Thank you Trollsmyth! This is how I phrased the rule for my own houserule document. Any player character, who is employing a shield and takes damage in melee combat, can opt to instead have their shield take the damage. The shield will be shattered and must be discarded thereafter, but the character takes no damage from that particular attack. I like it so much, I want to share the terror and excitement of that near brush with death with PCs of classes which normally don't carry shields. So, I'm extending the rule to include hastily improvised shields. Things which might be snatched up in a desperate attempt to ward off an otherwise fatal blow. 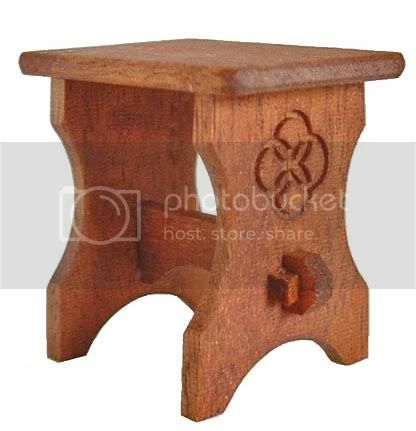 Items such as a stool, a chair, a saddle, a halfling, etc.. This way, magic-users and thieves, who usually need all the protection they can get, have a rule to give them a last chance to escape a cleft skull. Of course, same as with the shield, whatever object the PC grabs to serve as a shield is destroyed if made to absorb the damage the PC would have otherwise incurred. *regarding the halfling. Only NPCs may be sacrificed in this manner. PCs may not be employed as hastily improvised shields by other PCs. Pics are a nice medievalesque stool I found online, and a clip from a larger sketch by the mighty Jim Holloway, one of my favorite D&D artists. The Scorned Blade is the chosen name of an adventuring company composed entirely of renegade and outcast humanoids. Lead by the hobgoblin Zarkutz, the Scorned Blade includes, two orcs, Grum and Cazag, a bugbear, Grug, three goblins, Snool, Bugum, and Pulc, and a gnoll called Hykic. All are exiles, or outcasts from their tribes for one reason or another. This unsavory group is held together by the iron will and discipline of Zarkutz, that plus mutual need, and the fact that no one else will accept them. They are more than a match for the average party of low level characters because they work as a team and use every dirty trick they can muster. Ambushing travelers has been their bread and butter, but Zarkutz entertains grim dreams of making a name for himself as human adventurers do, and returning in glory to revenge himself on those who forced him from the tribe. To this end, he gathers what information he can in regards to lost treasures and magic. He also looks for the chance to capture alive any adventurers that may be able to teach skills that the Scorned Blade lacks. Zarkutz especially wants a thief to teach the goblins, and a magic-user to tutor Kazag. AC: 2, HP: 25, Move: 9, Int: above average, Alignment: Lawful Evil. Zarkutz wears a combination of jazerant and plate armor, and carries a falchion, (dmg: 2-8) and hewing spear, (dmg: 1-6). Having lost a power play within his tribe, Zarkutz was exiled with dishonor. The hobgoblin lusts for command and forged the Scorned Blade from other outcast humanoids he encountered simply to have something to lead. He speaks common very well, and will be interested in talking with any player character party that doesn’t attack immediately. At least, any party he can't over come easily. He will be willing to ally with adventurers if it is advantageous, and will adhere to the letter of any agreement made. Zarkutz will attempt to impress the members of a weak party into the Scorned Blade if he can dominate them. He will, at the least, quickly begin issuing orders to any indecisive appearing allies. AC: 4, HP: 30, Move: 9", Int: low, Alignment: Chaotic Evil. Grug wears heavy bronze chainmail looted from the cairn of a firbolg giant. He carries also a large shield and great sword,(1d10+1 dmg), which he easily wields one handed. Grug is very large for a bugbear. He is most enthusiastic, and not overly intelligent. Despite his chaotic nature, he applies himself to the strict lessons of Zarkutz, and as a result, he has become both a skillful and an erratic opponent. If faced with multiple attackers, Grug's first attack will be to bash the closest target with his shield. Opponents of lesser mass must Save VS Crushing Blow or be knocked down, requiring two rounds to get back up. Grug will use this time to attack the next closest target. AC: 7, HP: 8, Move: 9", Int: average, Alignment: Lawful Evil. Spells available: cure light wounds, light. A fanatic devotee of Baghrutu, Grum was driven out of his tribe by the dominant followers of Grumsh for the crime of heresy. He wears studded leather, and fights hand to hand with gauntlets of ogre power, (18/00 str, +3 to hit, +6 dmg). Grum will attempt to convert captured opponents to the worship of Baghrutu. He is passionate, but not eloquent. His favored method of attack is to blind his opponent with his light spell, and then close to pummel with his iron gauntlets. He would like to challenge Zarkutz for leadership, but secretly fears the ruthless hobgoblin. Not brutal enough to live among orcs, yet not sensitive enough to live with humans, Kazag is selfish, unpleasant, weak willed, and greedy. He directs his spells as commanded by Zarkutz, but will never expose himself to direct attack. He is not to be trusted, and Zarkutz makes sure the goblins always accompany him. They serve as both protectors, and minders. Kazag carries a dagger coated with golden adder venom, Save or suffer agonizing hallucinations for 1d4 days which completely incapacitate the victim. His spell book holds, Burning Hands, Hold Portal, Identify, and Spider Climb, as well as Read Magic. The goblins: Snool, Bugum, Poolc. AC: 6, HP: 7, Move: 6", Int: average, Alignment: Lawful Evil. Large for goblins, these three are brothers who were cast out for the pleasure murder of prisoners which their chief had intended to ransom. Scouts and skirmishers, they will close for combat only if ordered by Zarkutz. Each carries four javelins, short swords and shields, and wears studded leather armor. If the Scorned Blade should manage to capture a thief, Zarkutz intends to force him to teach the goblins his skills. AC: 5, HP: 14, Move: 9", Int: low-average, Alignment: Chaotic Evil. There is a strong possibility that Hykic is mad. His sharp barking laugh, which seems to come at random moments, is irritating. He was driven from his clan for, "unwarranted cannibalism". He is ferocious and reckless in combat, and Zarkutz employees him as a shock trooper to terrify and to herd targets into advantageous positions. He is without fear but obeys Zarkutz for reasons of his own. Hykic wears armor of horn, leather and metal, and carries a long sword and a halberd. AC: 10, HP: 4, Move: 9", Int: very, Alignment: Lawful Good. Mally is a slave and cook to the Scorned Blade. Her ability to turn odds and ends into good food is what saved her life when her traveling party was ambushed. The humanoids had never had cooking of such flavor, and Zarkutz knows a fighting force moves on its stomach. 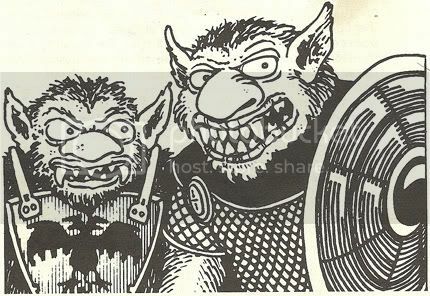 Hykic would like to eat her, and the goblins would enjoy murdering her, but the bugbear Grug considers her his pet, and to Zarkutz she is a tool to keep the group together. The Scorned Blade is only slightly above the average of humanoid combatants statistically. The thing that makes them dangerous is the fact that they fight as would a well disciplined human adventuring party. Zarkutz always attacks, and opens negotiations from a position of strength. He will not commit to a combat that he isn’t very sure of winning. There must also be a definite goal, or prize involved. Though, of course, he enjoys fighting as much as any hobgoblin, Zarkutz has priorities, and is not easily dissuaded. If the Scorned Blade becomes aware of a PC party before the PCs are aware of them, Zarkutz will first determine the strength of possible foes, or new recruits, and then determine a course of action. If the PCs are obviously too strong for the Scorned Blade, Zarkutz may either avoid them completely, or begin to shadow them, waiting for an opportunity to present itself. If the PCs are judged to be on close to equal footing with the members of the Blade, Zarkutz will offer a truce, he speaks common quite well. The hobgoblin will use any conference to gather information about the party and its purpose. If the party is competent and willing, and there is gain in it, Zarkutz may offer an alliance of convenience, for a time. Treachery is possible if the information leads him to reevaluate his first assessment of the PCs. He will, however, abide by the letter of any deal or agreement arrived at in negotiation. If the PCs are judged to be weak or at a disadvantage, then Zarkutz will most likely attack. Any useful survivors will find themselves conscripted into the Scorned Blade. If the Scorned Blade attacks with Surprise, or otherwise gets to make the first move, they are coordinated and business like. 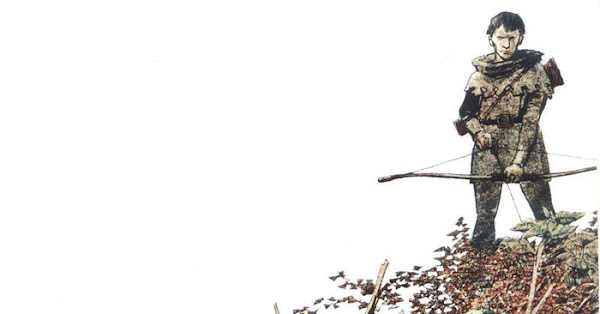 The goblins will hurl javelins from a distance, choosing unarmored targets such as magic-users first, clerics second. Grum and Kazgag will cast spells to cause confusion and damage from a distance, before Hykic, Grug, and Zarkutz move in to attack any obvious fighters. Grum will close to attack after expending his magic. Snool, Bugum, and Poolc will move in to melee once they have expended their missile weapons. They much prefer to gang up on a single, wounded opponent if possible. Zarkutz directs the actions of the others and they obey him without question, at least during combat. If the melee goes poorly, Zarkutz will order a withdrawal. If Zarkutz is himself killed, the others will flee. This is a version of an NPC party I sent James at Grognardia for his MegaDungeon project a while back. I’m pretty sure that's dead in the water now, so I thought I’d share it with my blog buddies. You can, of course, easily up rate the Scorned Blade for higher level play. I made them with the intention of providing a thorny problem for experienced players running low level characters. I think that’s about my favorite gaming scenario. Very good players running low to mid level characters who have to make do with what they’ve got. It just seems to have more juice to it, there’s more at stake somehow. High level play feels a bit too super hero-y to me for D&D. Not that I don’t love super hero rpgs, mind you. I’ll have to tell you about the time we demolished most of downtown Indianapolis in a brawl with A.I.M. I guess I just don’t like peanut butter in my chocolate. The top pic is cropped and lightened from the TSR Book of Humanoids, done by Sam Rackland I believe. 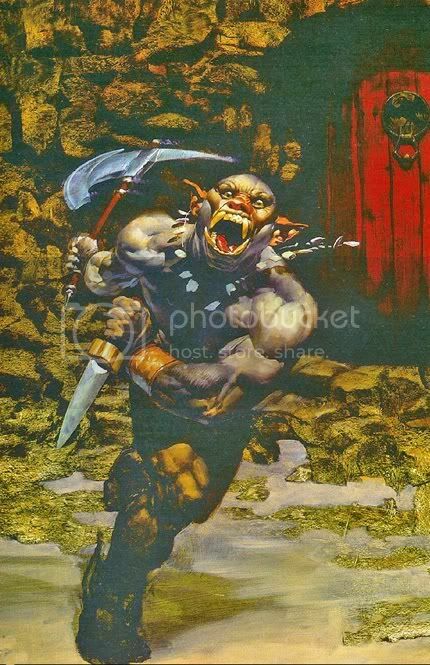 I like it a lot, it illustrates why Old Schoolers know not to mock the single orc guarding a door. You all know Erol Otus. Dig. Amongst those who seek to discern the form of the unknowable and define the shape of the ineffable arcane, few are the equal of Gyahzeere the Skryarch. Heretic priest of Boccob-Delleb and eldritch diviner, from his velvet cushioned marble throne-divan beneath the azure dome of his great sanctum psychomanteum; Gyahzeere seeks to know all that is unknown through the art of thaumaturgic extrospection. Recently, ripples and perturbations in the arcaethosphere have pulled at the edges of his expansive consciousness. Disturbances of a texture and quality unfamiliar to the mystic seer of Urnst have draw his attention to the east and south, to that no-man’s land contested by Nyrond, the Bone March, and the Great Kingdom. The grim Lands of the Unending March. Gyahzeere does not know what it is that causes the intermittent magical turbulences which intrude upon his prophetic divinations, yet he can discern that if it is not spell work, it is still magic of some sort, and powerful enough to resonate across many leagues. As his magic has thus far provided him little insight into the matter, Gyahzeere now considers choosing a cat’s paw to send forth to reconnoiter directly. The Skryarch is a most generous employer; coin has little meaning to his ever questing soul. Prospective agents soon learn, however, that acting in the interests of Gyahzeere may bring most unsettling consequences. Concurrently, as the diviner-mage ruminates on which path to understanding is the most applicable; another already near upon the source of the hidden magic has begun to gather up the loose threads of happenstance. Hearozaul the Shining Priest, devotee of Pholtus, adherent of the Rightful Way, the curiosity of his brilliant mind piqued, has commenced to acquire and scribe accounts of inexplicable and apparently, “miraculous” events which have taken place within and about a large area which appears to center upon the town of Borlem. The stories which Hearozaul has thus far gathered seem to have no relationship, one with another, and yet the Enlightener feels there must be one. He prays that Pholtus cast his revealing luminosity upon that which remains shadowed. That of the kind, but quite homely, goose girl who, before the very eyes of the shoemaker’s children, was enveloped in color and suddenly became a ravishing beauty. The account of the four days rain of wine which fell only upon the estate of Samsar the Vintner, killing all of his grape vines. The foul death of Wamsucsh the Usurer, the cause of whose demise was later found to be that a very large rat had somehow crawled up his arse, and there, died. The beautiful music which played from thin air for the space of one hour in the taproom of the Blue Boar Inn. The scrawny cow of the charitable crone of Duhn which began giving foaming ale rather than thin milk, and apparently still does so. The tale of how Secoulm the Riff of Lunh met with his bizarre demise, vomiting forth gallons of urine before,” drowning “in the street, his lungs filled with piss. Hearozaul has expended a great deal of his personal time upon investigating these happenings, but as yet, has reached no conclusions. Something turns aside his priestly magical enquiries. The constant threat of the inhuman raiders across the Harp commands the lion’s share of his attention. The infirmities of the fearful peasantry demand his action. As his superiors in the order evince no interest in what they declare to be minor devilry or else random arcane circumstance, Hearozaul now muses over the possibility of hiring a spadesman to turn the ground in his stead and perhaps unoerth further clues to the puzzle which tugs at his robe. Unknown to either the Priest of the Shining One or to the Master Skryer, the source of both the eldritch turbulence and the inexplicable occurrences is in fact, the worn and lonely gallows pole which stands at a dusty cross roads some small distance from Borlem. In that endless moment before death and judgment, those who die by the noose upon the pole are spoken too by a voice which only they may hear. The voice asks no bargains and makes no demands. It instead offers a final Wish to the condemned, requiring nothing in return. The only limit attached to the wish is that it may not prevent the death of the recipient. All of the unexplained events, (save the music in the Blue Boar), are the results of the last wishes of those who have hung from the gallows pole. This is magic of no small power. The source of the voice is unknown, likewise the reason for its offer. Not all who die upon the gallows at the crossroads are spoken too by the voice. Why some are granted this final “gift” and others are not is also unknown. The gallows at the crossroad may be inserted into an existing campaign in many forms and serve many purposes. It may be that the PCs are hired as investigators by one or the other of the concerned parties. It may be that a friend, hireling, acquaintance or relative of the PCs dies on the gallows and by way of the wish embroils the PCs in unexpected events. If your group is sufficiently thespian in leanings, in may be that one of the PCs themselves swings from the pole. The gallows may be used as a hook, or an entry point to adventure, and also as an end point. The voice may belong to any number of beings, mortal, infernal or divine, or other. Perhaps the speaker gains in some way from the deaths of the hanged. Perhaps it only rewards those who died wrongly. Perhaps it offers the final wish as a test. It may be that something lies buried beneath the pole, or perhaps nearby. The cross roads itself may be the center of the magic rather than the pole, certainly cross roads have the reputation of drawing the unoerthly. A gate of some sort may be connected to the cross roads. I like to have things like this in The Game and simply not explain them. The imaginations of the players will often conjure forth more lurid and terrifying suspicions than I could have stated out myself. I love a thick atmosphere of mystery and weird fear to marinate the players in, before their PCs get eaten.